Improve the quality of your video using professional video filters. Trim, cut, split, and join video clips to create your own video story. Insert stylish transitions between video episodes for a smooth progression through your production. Edit video files in all popular formats: AVI, MPEG, MP4, MOV, WMV, DVD (VOB, IFO), 3GP, and others. 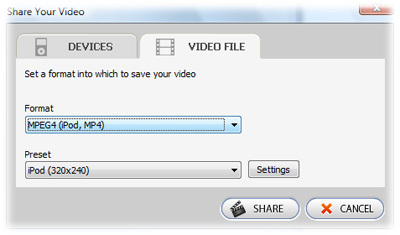 Capture video from MiniDVs and web cameras right in the program. Save edited video in all popular formats and for a range of mobile devices – iPod, iPhone, PSP, Zune,Blackberry, cellphone and many others. 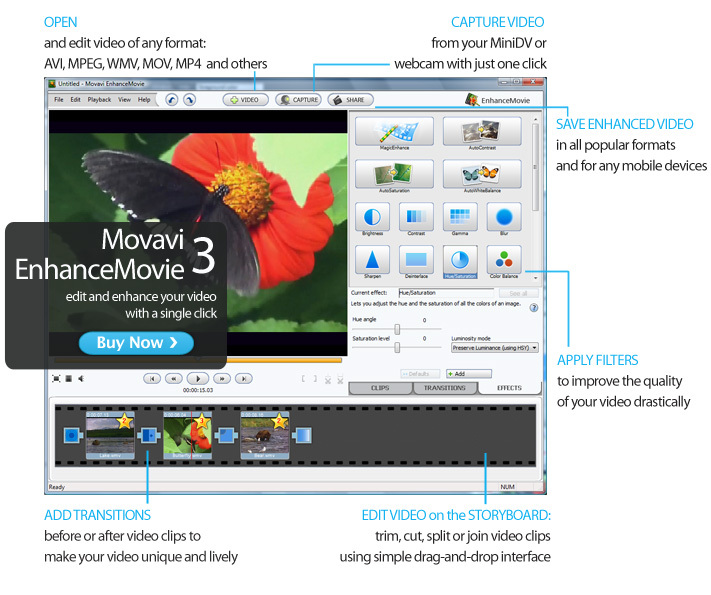 Movavi EnhanceMovie boasts a powerful set of automatic video filters that that can drastically improve overall quality of almost any video and fix a whole range of problems. The Magic Enhance filter, for instance, automatically removes any color casts by calculating the best balance of colors for each frame of the video. This filter also fixes brightness, contrast and color levels. Customizable video filters enable you to fine-tune the results of video restoration, defining the desired level and parameters of every single improvement you introduce. Each filter is designed to fix a specific video problem, such as interlaced or blurred video, poor color balance, insufficient brightness, lack of contrast, and many others. Movavi EnhanceMovie also offers an amazing selection of video effects that will liven up your video and give it a professional feel. Make your home video look like an old 30’s movie or create a futuristic atmosphere – your imagination is your only limitation! Take advantage of a range of essential editing tools: split your video in parts, trim or cut out segments, even join multiple clips to make a single longer movie. Enjoy the simple drag-and-drop editing interface with the new Storyboard feature. The Storyboard is a “working area” that displays the sequence of video segments you have selected for processing. Drag a video clip to the Storyboard to improve it, apply different effects to it, or add animated transitions. A transition is applied to the end or to the beginning of a video clip, making it begin or end with some visual effect (for example, fading out), or to two clips so that they link smoothly one to the other. Choose from more than 15 stylish transitions to insert between video clips, or at the beginning or end of your movie. Define basic transition settings (such as duration, direction, etc.) and preview the transition. Input Formats: AVI, MPG, MPEG 1,2,4, QuickTime (MOV, QT), WMV, ASF, IFO (DVD), VOB (DVD), 3GPP, 3GPP2, DAT (Video CD), h.264. Output Video Formats: AVI, MPG, MPEG 1,2,4, QuickTime (MOV, QT), WMV, ASF, IFO (DVD), VOB (DVD), 3GPP, 3GPP2, DAT (Video CD), Real Media (RM, RMVB), h.264. Output Audio Formats: WMA, WAV. Output Image Formats: BMP, GIF, JPEG, PNG. Use any available video and audio capturing devices. Extract stills from your live video and save them as bitmaps. Choose from a variety of available video formats to save your video. Customize the format settings for optimum results. 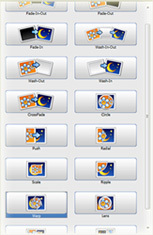 No need to customize any format settings – just choose your device from the list and click ‘Share’!